Posted on October 2, 2018 at 5:59 am. LAST CALL for PE swag! Time’s almost up to order your WMS Hoodies, Sweatpants, or Long Sleeved T-Shirts! Order forms must be turned-in to your Health of PE teacher by this THURSDAY at the latest. Don’t get left out in the cold — order your Fall PE gear today, and Be a Part of the Pride! Calling all math lovers! Math Counts will be meeting TODAY during ASP 1 in room WW 1 for its first meeting of the year. All 6th, 7th, and 8th graders are invited to do math problems, play math games, and perform many other math activities. It’s all math — all the time at Math Counts!! See Mr. Mencarini for more information. The WMS Kindness Club meets TODAY during ASP 1 in room 201. There’s a LOT to work on to get ready for this month’s activity. All are welcome — new and old. Any questions, please see Ms. Schaefer, Ms. Zeller or Mr. Johnson. Hey 6th graders! Do you like puzzles, enjoy brain teasers, or crave mental aerobics? Then the “BrainStretchers Lunch Club” is for you! 6th graders are encouraged to check out this new “critical thinking” group — WEDNESDAY during your grade-level lunch. But space is limited, so 6th graders must email or contact Ms. Edme in room 135 to participate. Get your thinking caps on and join BrainStretchers! Finally today, it’s time for “Champions of Change” — honoring the innovative, courageous, dedicated Americans who helped to shape the world we live in. In celebration of Hispanic Heritage Month, Champions of Change will be highlighting important figures from the Hispanic-Latino culture. Pay close attention — because next week these Champions will be the focus of a Trivia Contest at your grade-level lunch. Here we go! Our first Champion of Change is Sonia Sotomayor, the first Latina Justice to serve on the Supreme Court of the United States of America. 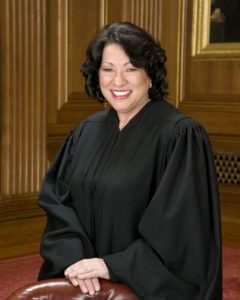 Sotomayor was born in the Bronx, New York City, to immigrant parents from Puerto Rico. Raised by a single-mother following the tragic death of her father when she was only 9 years old, Sotomayor overcame every obstable in her path. She graduated with the highest honors — first from Princeton University and then from Yale Law School. 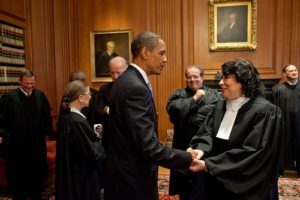 Following decades as a successful attorney, professor, and federal judge, she was nominated to the Supreme Court in 2009 by President Barack Obama, and was confirmed with a strong bi-partisan vote. She is now an important voice in our nation’s highest court. Her efforts truly make her a Champion of Change!